We’re looking forward to putting the finishing touches on Hoots Treehouse this month. 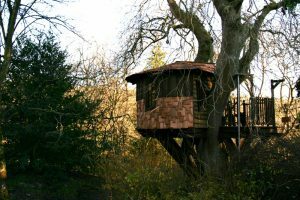 Tucked away in the upper reaches of the ancient Rother Valley, the treehouse overlooks a dew pond on the edge of private woodland in an area of outstanding natural beauty. The treehouse, which has been exclusively designed for our client, encompass all the key elements that are core to treehouse life; imagination, escapism and adventure. Blue Forest is regarded as the world’s leading tree house consultancy and is renowned for designing buildings that not only reflect the environment in which they are built but that offer a completely new product for the hotel and accommodation market. It was incredibly important to us to create a structure that worked with the environment rather than against it, to help complement the beauty of the Sussex countryside with minimal impact rather than disrupt it. As expert designers, we know our client wanted to be able to offer their guests a comfortable yet luxurious stay, and Hoots Treehouse has been finished to the highest standards. 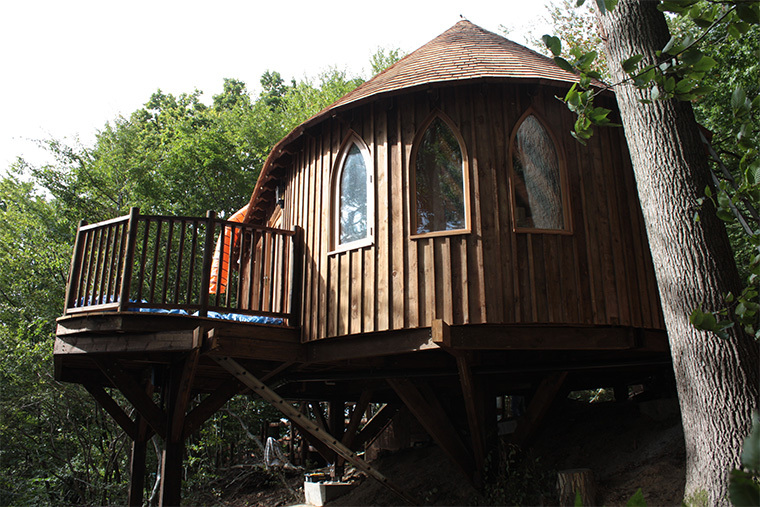 The spacious treehouse has been designed to accommodate up to four guests, with a king size double bedroom and a sleeping loft with two single beds for children. With a 40” TV, Bose speakers and a cosy wood-burner, you can enjoy all the comforts you would expect at home. Complete with a self-catering kitchenette, you can choose to prepare a meal yourself and enjoy al-fresco out on the deck or explore some of the local villages for a pub lunch. The accommodation includes a beautiful bathroom with shower and heated towel rails. Arched windows give a touch of fairy-tale magic to the design, and double glass doors let in plenty of natural light.